But a word of advice: Feel free to sit on the edge and get your feet and ankles wet, but don't wade in the water. "It is also considered to be highly disrespectful to World War II veterans, sadly most of whom are no longer with us," Line said. "There should be a high level of respect and decorum displayed at all times at the Memorial." What is the consequence if you get caught? A park ranger will likely ask you to stop. But if you continue to show a lack of respect -- and class -- U.S. Park Police may get involved. "Each situation is unique, but depending on how the person conducts themselves, officers have discretion and can make an arrest," Line said. And don't even think about taking the pooch for a dip in the pool, either. No pets are allowed at the World War II Memorial -- period. "The World War II Memorial is not and never has been designed to be a swimming pool," Line said. It is to commemorate and honor the supreme sacrifice that 16 million people made during World War II." The rules are similar at the other monuments on the Mall that include water. 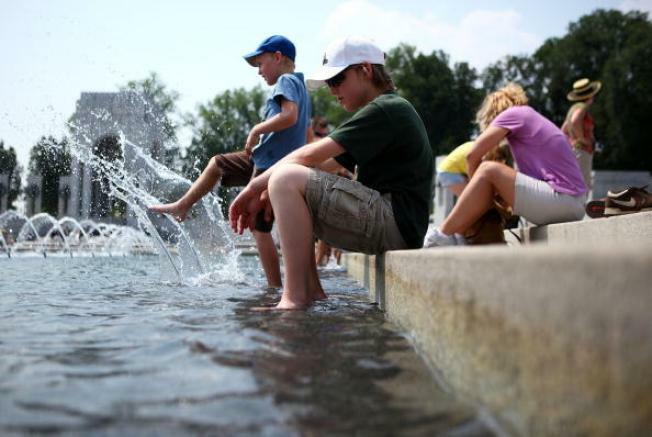 While the water at the WWII Memorial is filtered, the same can't be said for the Tidal Basin or Reflecting Pool, which is actually water from the Potomac River.